It was a record year for Christina and Lauren McHale in more ways than one. 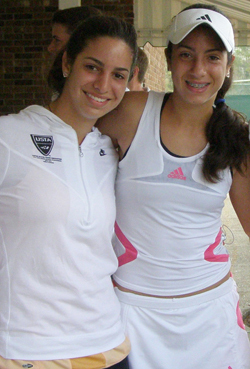 Not only did both win and place in multiple national events, but they also matched a 28 year old junior tennis record. The McHales, who actually spent a good part of the year as-close-as-can-be ranked No. 4 and No. 5, finished 2007 ranked No. 7 (Lauren) and No. 10 (Christina). They are the first siblings to be in the top 10 year-end rankings in the same age division since 1996 (Bob and Mike Bryan), and the first sisters to do so since 1979 when Andrea and Susy Jaeger managed the same feat. Andrea, who turned pro a few months later, was three years younger than her sister at the time. Christina and Lauren learned to play tennis nearly a decade ago when they were in Hong Kong (their father's work was temporarily located there). They brought their talent back to New Jersey where the Eastern competition kept them on their toes (six of the top 20 girls in the country are from that section). Though their one try at playing doubles together didn't work, they can handle being on opposite sides of the court. They've played each other at two major tournaments with Christina winning at the National Clay Court Championships and Lauren taking the match at the National Spring Championships. Between them, Christina and Lauren McHale have placed in 38 national events. They own seven Gold and nine Silver USTA balls for wins at the majors. And they're not done yet. Christina is just 15 years old and Lauren 17, with time until the fall before she goes to college. Though her sister outranked her in 2007, it 15 year old Christina who has excelled just a bit higher than her sister on the court. This is her third top ten ranking nationally (she was No. 1 in the Girls 14s in 2005; No. 2 in the Girls' 12s in 2004). In 2005, she was the singles winner at the Franklin National Winter, Maureen Connolly Brinker Championships, Gator Bowl and USTA National Winter Championships. She also came in second or third at four other events. Christina won the singles at the USTA National Claycourts in 2006 (the year she made the transition to the 16s). This past year she won the doubles (with Stacey Lee) at the USTA National Spring Championships in the 18 and under division and came in 4th in the singles at the Claycourts. Also in 2007, Christina ventured out to the Pro Circuit, shocking her elders with a place in the singles finals in Brazil, where she also won a doubles event with partner Allie Will. In the U.S., she and Kim Couts made the finals of the $10K in Houston. Lauren McHale has shot up the rankings like lightening in the last two years, finishing No. 9 in the 16s in 2006 and two spots up -- while moving up -- this past year in the 18s. In 2006, while she only won one national (a National Open), she placed in the top four of eight other events around the country. She had similar results in 2007. After sweeping a National Open in May, she made it to the finals at the National Claycourts and USTA International Hardcourts -- in singles and doubles (with Krista Damico). She is literally on her way to her first Grand Slam event, the Australian Open Junior Championships. I spoke with Christina and Lauren McHale when the preliminary final rankings were out at the end of December. They were enjoying some rare time at home, having chosen to skip the National Winter Championships for the first time in four years.